One day a group of friends were enjoying some wine together and started talking about how cool it would be if they would start making their own. We've all done this from time to time, jokingly. But the founders of Alpasión actually went ahead and followed through with it. Located in the Uco Valley region of Mendoza in Argentina, this winery owns 85 hectares of land (60 of them being vineyards) at 1,200 meters above sea-level. Although it doesn't look like they're certified just yet, they live by the code of sustainable organic farming. Right now they only make two wines. I've already reviewed their 2013 Malbec and today I'm reviewing their 2012 Private Selection. The 2012 Private Selection is a blend of 58% Malbec and 42% Cabernet Franc. It appears that the blend changes from year to year because a previous vintage is said to have 50% Malbec, 25% Cabernet Sauvignon and 25% Syrah. Anyways, the vines are fifteen to twenty years old, the grapes are hand harvested, the wine is barrel fermented with native yeast and then aged in 100% Bordeaux style oak barrels for eighteen months. Can I just say that I am actually, literally, in love with their packaging? 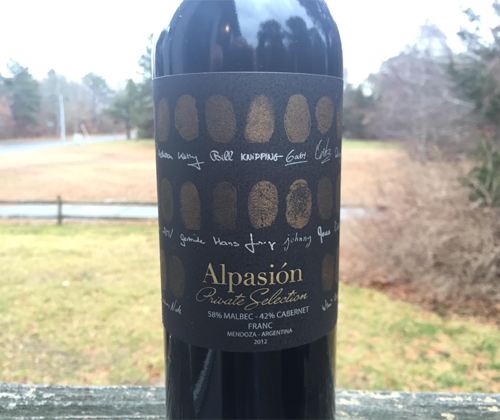 The label features the fingerprints and signatures of all of the winery's owners. I count thirty-three. For me it shows you that lots of hard work by many completely different people, individuals of an advanced species of primates with different stories and experiences, all came together to turn sunlight into the very beverage contained within that glass container. It totally speaks to the geek in me, and my heart swoons over it. The color of the wine is garnet. On the nose there's a minerality like you've just been cracking stones by clapping them together. Then there's chocolate milk syrup, Greek olives, orange bell pepper (I don't know why but my olfactory memory is totally pointing to the orange kind of bell pepper), and pencil lead. In the mouth it's medium to full bodied with a slight touch of sweetness and a grainy mouthfeel. The chocolate milk syrup continues on the palate but the orange bell pepper turns into your typical green pepper. The fruit is almost like a stewed concoction of dark fruits, and there's notes of vanilla and caramel. It's kind of strange to be getting a Cabernet-Franc-from-Lodi kinda feel off of this than a Malbec-from-Mendoza kinda feel. For a $40 blend without specifics, I'm on board with it. It's of the quality that it's asking for in its price range for red blends. But for a Malbec / Cab Franc blend from Argentina? You need to suspend your expectations and enjoy the wine for what it is. And really, we all need to do more of that.